Since their inception, deer grunt calls have given hunters an excellent tool for attracting whitetails. Some of these calls accurately re-create several whitetail deer vocalizations, and used in the right situations, can prove deadly for whitetail bucks. With a myriad of calls available today, which one should you use? 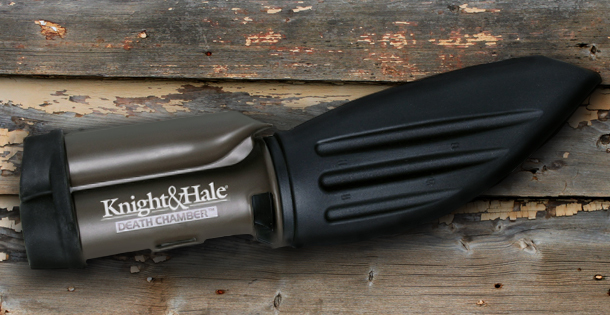 Knight & Hale Game Calls is considered one of the industry leaders in game calls and hunting accessories. Their mantra speaks volumes about their quality and confidence in their products: Become A Better Hunter with Knight & Hale Game Calls. New for 2011, K&H introduces their newest tool in deer vocalizations— the Death Chamber. The Death Chamber is the ultimate deer call on the market today thanks to its versatility. With a slight twist of the call all deer sounds can be made—ranging from a fawn, to a doe, and finally to the biggest, baddest buck in the woods. The call also has the capability of making the grunts of a young buck, which will incite big mature bucks during the pre-rut and rut phases. With the addition of a snort wheeze chamber on the call, you now have the full arsenal! If you are hunting in an area that is overrun with does, simply dial the call to imitate a doe or a fawn and get your gun ready. The does will come running. When hunting during the pre-rut phase I like to dial the call to sound like a young buck. At rut time when the big bucks are cruising and checking scrapes looking for hot does, I suggest alternating between buck grunts and doe bleats. When a big buck comes into view and doesn’t respond to your call, fire him up with a snort wheeze that will sound like the meanest, maddest buck in the woods. This vocalization signals another buck that is ready to challenge the intruder for the right to breed the area’s does. With the K&H Death Chamber, gone is the need to wear four separate calls. Now you can have all the calls in one convenient, ergonomically designed call— the Death Chamber.